I am pleased to announce that I have been awarded an Australian Network for Art and Technology SYNAPSE Grant in the latest round. This grant is for an art/science collaborative project with A/Prof M. Dottori, Illawarra Health and Medical Research Institute. University of Wollongong and A/Prof B. Nayagam, Bionics Institute, University of Melbourne. 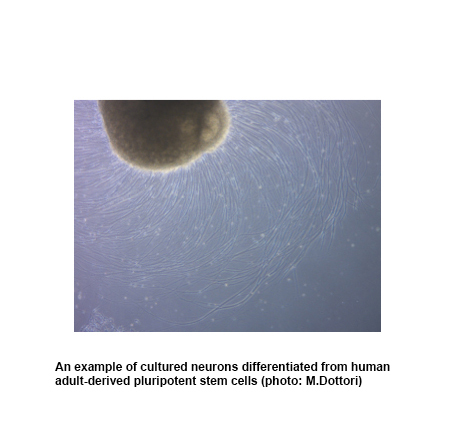 We will explore human neuronal responses relating to the senses by employing laboratory generated models of how our.brain receives electrical signals from these sensory neurons. I will reinterpret the cutting edge scientific data from the perspective of a visual artist to create sensuous, interactive art installations to be experienced by the viewer/participant. Designed to allow you to watch video footage of honeybees in great detail on your smartphone via remote QR Code access; this artwork provides an unusually intimate viewer experience, and one that brings these tiny creatures up-close as if you were actually holding them in your hands. My latest artwork, OBVERSE is part of a landmark exhibition Femel_Fissions at the Block, Creative Industries Precincts, Brisbane, Australia. Femel_Fissions traces the historical influence of women on scientific discovery and research through newly commissioned works from leading Australian and international artists. Featuring seven contemporary female art/science practitioners, Femel_Fissions will showcase works that have been created in response to groundbreaking discoveries by female scientists from the last three centuries, exploring the fields of neurology, biology, cytogenetics, psychology, primatology and anatomy. Breaking down the boundaries and drawing commonalities between art and science, Femel_Fissions shows that both the artist's studio and the scientist's laboratory are sites for unrestricted inquiry and experimentation in this unique exhibition. In a rare art/science opportunity Trish Adams was admitted to the Australian Synchrotron’s Imaging and Medical Beamline (IMBL) to capture images of live honeybees. The IMBL delivers short, modulated bursts of radioactive light. This dynamic X-ray process transgresses the external boundaries of the body to reveal the active internal processes taking place within. The artwork Honeybee Raree Box is informed by the historical construct of the Raree Box. These transportable boxes contained images that were viewed in the manner of a ‘peep show’, thrilling viewers in an era long before the abundance of images we experience today. 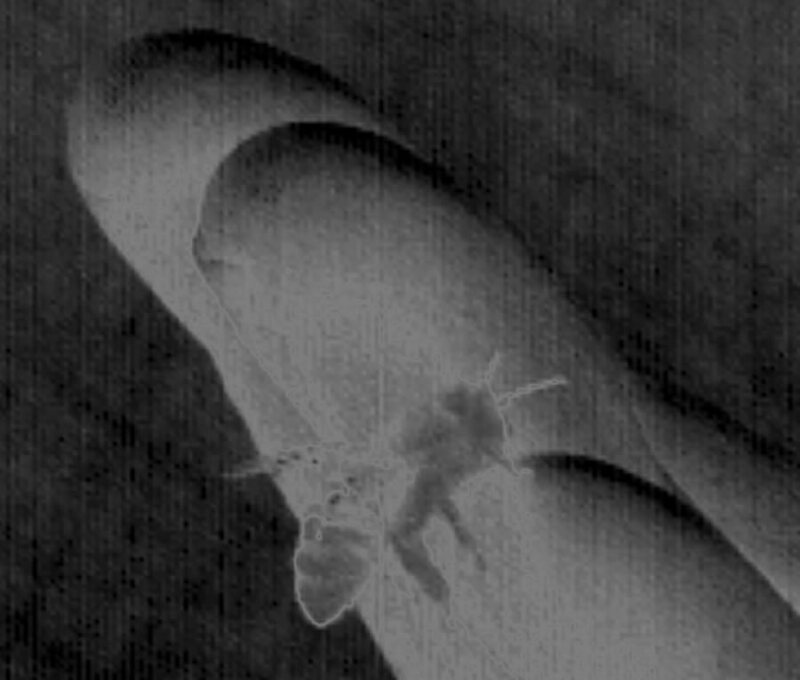 This historical reference is juxtaposed with a video of the unique, cutting edge Synchrotron images of bees playing on an ipad at the back of the box, emphasising the voyeuristic aspects of ‘illicit’ viewing and re-creating the wonder of the ‘spectacle’. 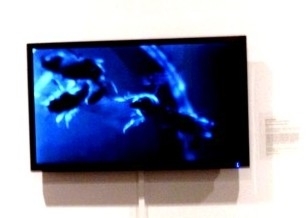 HOST will be showing in the exhibition Creaturely Feelings at the Multimedia Gallery, DAX Centre, Kenneth Myer Building, University of Melbourne, 30 Royal Parade, 12-18 July. I will also be presenting a paper at the conference entitled: European Honeybees: Interconnectivity at the Edge of Stillness. It shows participant engagement with the interactive artworks: “Inaudible City” and “Fractured_Message” at the exhibition opening on Thursday 9th April 2015 @ the HEARing CRC, Carlton. (Image below of Trish Adams courtesy of the Melbourne Leader, Herald Sun Newspapers, 2015). 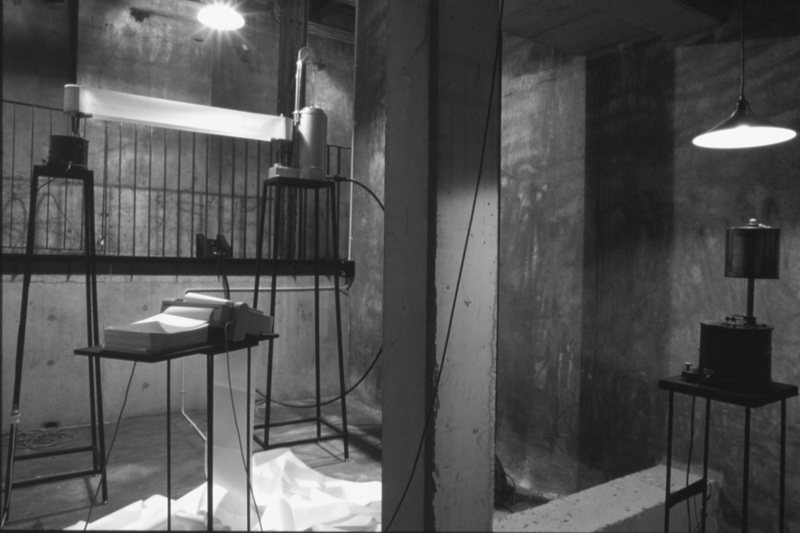 This is a screen grab from the artwork: Inaudible City. Aspects from a modified video of the City of Melbourne are highlighted to correspond with 4 customised soundtracks. (Patricia Adams. 2015). Some months ago my hearing loss project moved into the artwork development stage and I began to collaborate with Dr. Jonathan Duckworth, Director of CiART, School of Media and Communications, RMIT. Discussion and access to specialist media support, provided by CiArt, enabled me to create two artworks: Inaudible City and Fractured_Message. 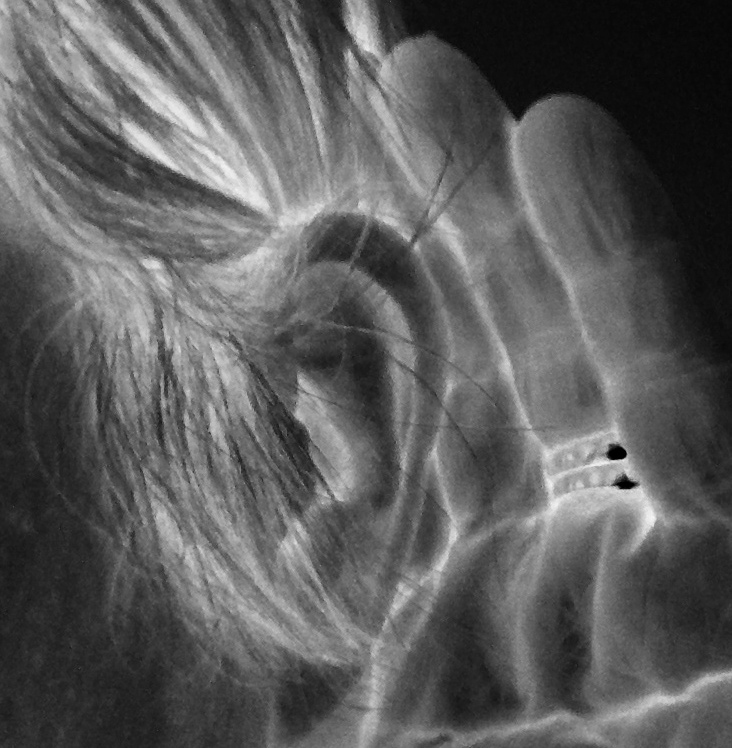 My aim has been to provide viewers from the wider community, who have normal hearing, with an immersive, sensory experience that increases their understanding of how hearing loss feels, along with some realisation of its impact on everyday life. Briefly, the custom made soundtracks of Inaudible City have been distorted to resemble 4 distinct types of hearing loss. Seeing & hearing in this way may give the artwork viewers an experiential understanding of some of the challenges face by the deaf. Fractured_Message is a one-on-one artwork where the aim is to create an experience that evokes the frustration and isolation of a hearing impaired person who cannot commnicate. These unique artworks have come to the attention of the HEARing Cooperative Research Centre (HEARingCRC), The University of Melbourne. 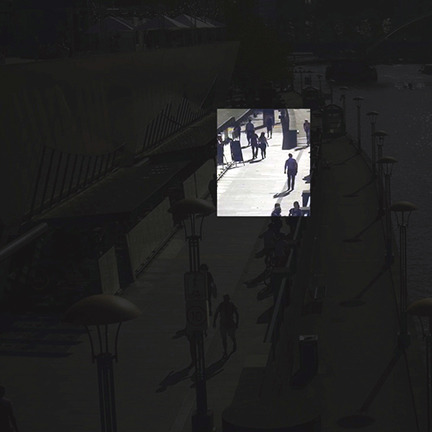 The HEARingCRC will host the inaugural showing of Inaudible City and Fractured_Message in an event entitled: Disconnections, Thursday 9 April, 5.30-7.30, The University of Melbourne’s Audiology and Speech Sciences Building, 550 Swanston St, Carlton, Melbourne. This free event is open to everybody, however modified versions of these two artworks will also be uploaded onto the designated website for wider access - links will be posted here soon. This project has been supported by the Australian Government through the Australia Council for the Arts, its funding and advisory body. Credits: Dr. Patricia Adams - Artist and Visiting Research Fellow, RMIT School of Health Sciences; Prof. Antonio Paolini, - Discipline Leader, Psychology, RMIT School of Health Sciences; Dr. Jonathan Duckworth - Production and Design, CiART Director, School of Media and Communications, RMIT; Ross Eldridge - Real-Time Programming; Alex Zemtsov and Brendan Peterson - Original Cinematography and Editing; David Vatousios - Actor, Fractured_Message. This is a Research and Development project that aims to profile the impact of deafness on the hearing impared in everyday life by increasing public awareness of the issues encountered when a vital sense like hearing is damaged. The project will include a hands-on research phase in Prof Paolini’s labs, leading to the creation of a variety of prototypes for interactive artworks with which the public can engage. For approximately the last year I have been applying for some beam-time to take live bees for X-Ray Tomography at the Australian Synchrotron. Several times my proposal has been refused on scientific grounds but, with the amazing support of the Medical Imaging Beam specialist: Chris Hall, it was finally accepted and given a window of opportunity. My aim was to capture image data of the insides of the bees as they moved around and ate. The bees were not harmed by the radioactive beam since insects, such as honeybees, are far more resilant than humans to environmental toxins and also their exposure time to the beam was short. Here you see the Radioactivity-proof door to the facility. Chris is shown here organising the image capture process. On the left side of the left monitor you can see the synchrotron beam line itself and on the right the view of the bees in a box on a turntable waiting to be imaged. There are already some very exciting video clips which I will be recontextualising into artworks asap. 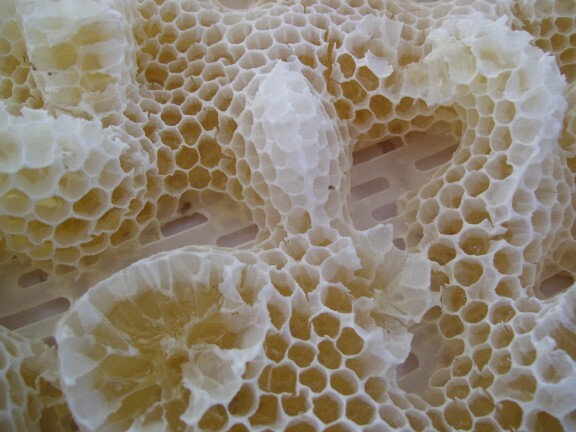 I had no real idea how intricate the internal organs of honeybees are nor the detail of a proboscis absorbing food. Hoping for plenty of interested attendees!! Last weekend on a visit to Brisbane I was able to get down to the Gold Coast City Gallery to view the exhibition of finalists for the prestigious Art Prize. My recent video:Disordered Swarmingwas one of the works selected by the judge: Chris Saines, the newly appointed Director of the Queensland Art Gallery. It was a varied & interesting selection & I had difficulty making my own pick to vote for the upcoming “People’s Prize” - I’ll be watching the outome of that with interest. The exhibition continues until Sunday 9 February for those of you in the area. I’m very please to say that my new video installation: Disordered Swarming will be showing as part of this event. An image of ‘burr comb’, which bees make in odd locations. As you can see it is distorted and irregular in shape & to me symbolises the damage being done to the bee communities. Because of the locative nature of “Urban Swarming” you do not have to be in Sydney to participate - you just need your smart device, headphones, the Internet to view in the busy city location of your choice! I hope participants will also join in and leave their comments at the developing on-line hiveminded community…. The video HOST will be showing in the Creativity & Cognition Conference Exhibition, 17th-20th July inclusive @ UTS, B10 (CB 10), 235 Jones St, Broadway, Sydney. Opening on the 17th, 7.30-9.30pm. In this instance the emphasis will be on the way HOST highlights the elements of honeybee consciousness revealed in the documentary footage used in the video, that was captured during my residency with the Visual & Sensory Neuroscience Group, Queensland Brain Institute, The University of Queensland. Urban Swarming includes my recent video: a space to cross, created from documentary footage of aggressive bee responses. Urban Swarming looks at the endangered status of the European honeybee through a comparative juxtaposition of the viewing experience played out against the hubbub of commuters in the rush-hour at busy urban locations. The video images of desperate, aggressive honeybee responses are viewed against the backdrop of the rushing mass of the urban population, scurrying hither and thither. 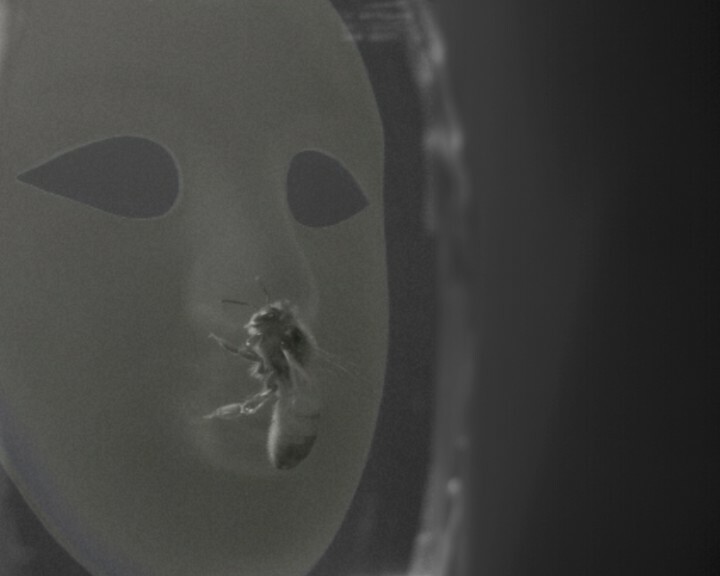 Both humans and honeybees exhibit mindless – possibly doomed – behaviours. Briefly, this work will be set up with a QR Code link so that viewers can download it on their iPads or iPhones in strategic Sydney locations - it can also be accessed on my website for those not in Sydney. Viewer responses will be collected on the designated artwork website. More to follow nearer the install date!! The Second International Conference on Transdisciplinary Imaging at the Intersections between Art, Science & Culture will be taking place on the 22 - 23 June, 2012. The theme of the Conference is Interference Strategies for Art. A garden can be a place of contemplation, cultivation or control. In a world of increasing urbanisationand biotechnical advancement what will the future be? What roles will the creatures in it -human and non-human play? Curated by Donna Frankllin, participating artists: Geoge Gessert, Alexandra Daisy Ginsberg, Angela Singer, Trish Adams, Svenja Kratz, Tarsh Bates, Donna Franklin, Kirsten Hudson, The Made Generation Collective, Gary & Suzie Cass, Jesse Brown, Nicholas Lozanovski & Sasha Whittle. The mood of this video is very different from my earlier bee video: HOST since it focuses on aggressive bee behaviours as metaphor for uncontained emotions…the original footage for this movie was collected during my artist residence with the Visual & Sensory Neuroscience group, Queensland Brain Institute.